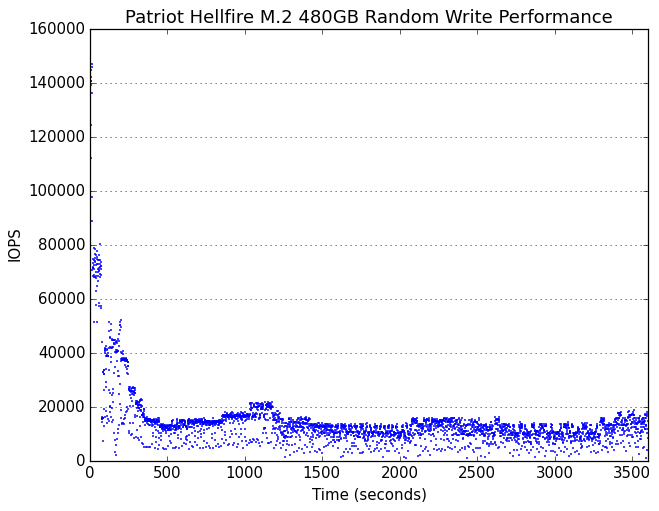 The Patriot Hellfire maintains a higher average random write speed than the significantly more expensive OCZ RD400 and the older Samsung 950 PRO, but the Plextor M8Pe performs even better, especially when heatsinks are used. 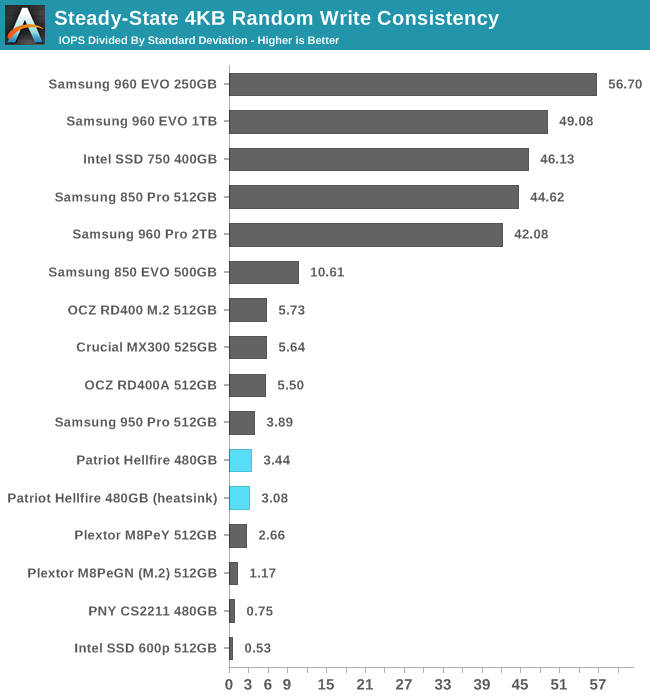 The Patriot Hellfire does not have the very high consistency of the Intel SSD 750 or most of Samsung's SSDs, but the score is not worryingly low. For consumer-oriented products, consistency under sustained write load is generally a lower priority than high burst performance and quick recovery during idle times. 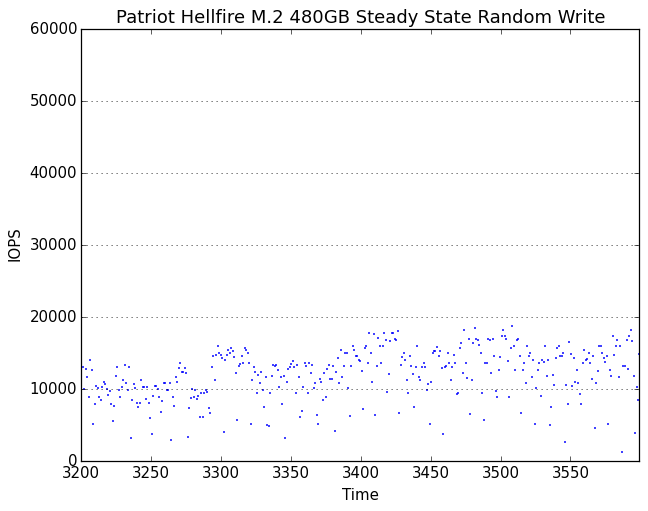 The Patriot Hellfire shows some long-term fluctuations in random write performance, especially when equipped with a heatsink to allow for higher peak performance. With extra overprovisioning, the long-term trend is very stable and the effect of the heatsink is greatly reduced. On shorter time scales, the Patriot Hellfire is never particularly consistent. Adding a heatsink increases the peak performance but only helps the minimums slightly. Adding extra overprovisioning greatly increases the amount of time spent operating at or near peak performance, but does not entirely eliminate the drops down below 5k IOPS. "Which has more endurance" is a false choice! MLC has more endurance than TLC. can't even compete? this SSD is priced about the same with a 850 EVO SATA3, and a lot faster. 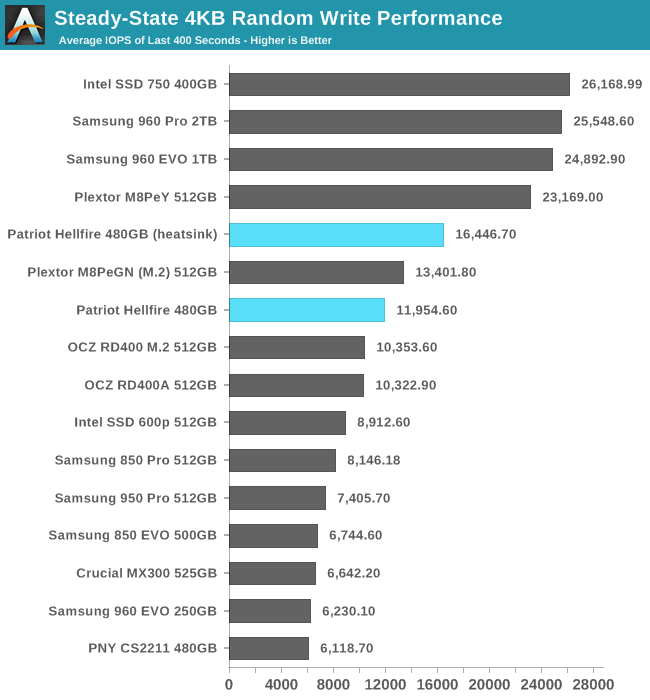 try not to compare it with other SSD's that cost double. in reviews they put it up against the best so you can have an ideea where it sits. Everybody has a naming scheme. What's wrong with copying names already used by weapons, for a company named patriot?